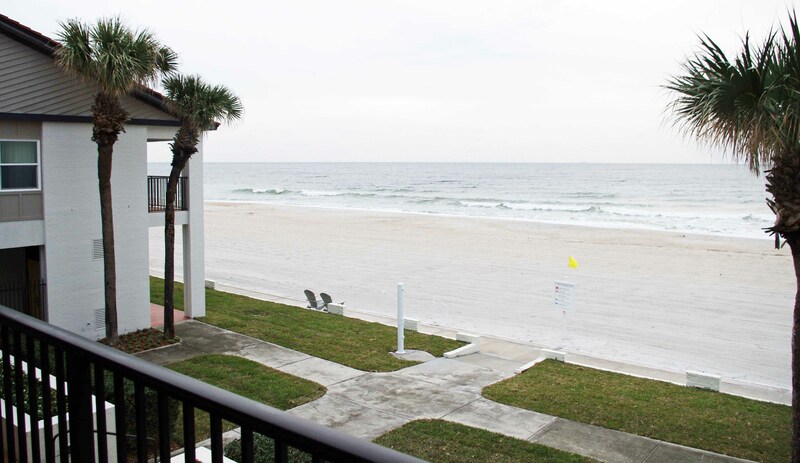 Ponte Vedra, FL- It is nine in the evening and I am sitting on my second floor balcony with my buddy Steve overlooking the sandy beach, only 100 feet away, while being serenaded by the constant pounding of the Atlantic Ocean lapping up on the shore. 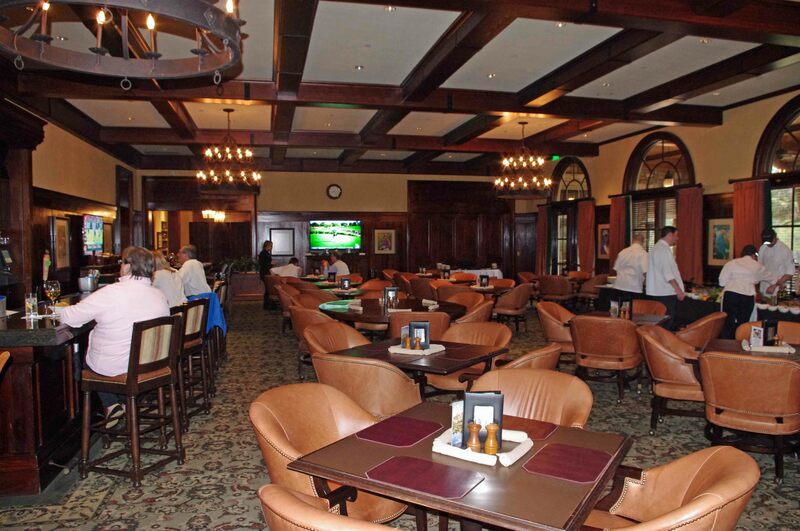 We are staying at the opulent Five-Diamond rated Ponte Vedra Inn and Club, a historic oceanfront gem that has aged very well since its birth in 1928 and, home to two championship golf courses. 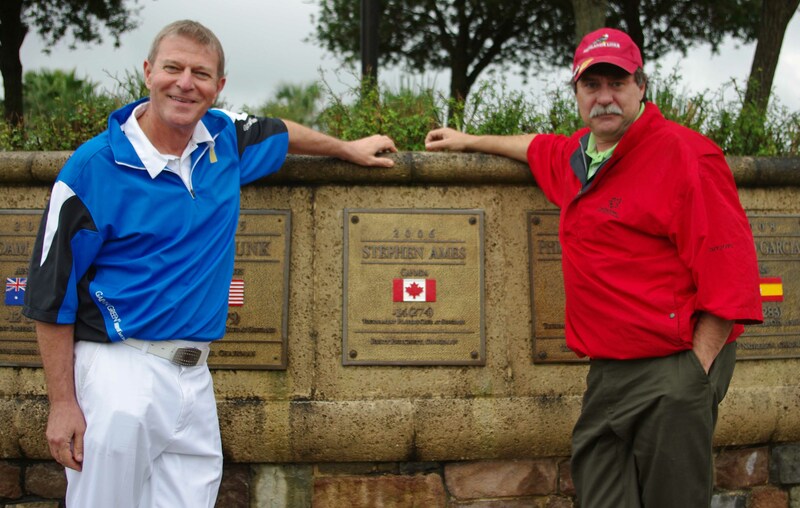 Our plans for the day were to play their Ponte Vedra Ocean Course, the selected site to the cancelled 1939 Ryder Cup. Unfortunately the weather man had something to say about that. We persevered but were only able to squeeze three holes in before the heavens opened up. Thankfully we did get a chance to tour some the course to get a feel for it. You can definitely see the Robert Trent Jones influence here from when he redesigned the layout in 1947. This is a very well-conditioned inland layout with stately homes lining the wide and forgiving fairways. Even though the Ocean Course sits on a relatively flat piece of property Jones has incorporated plenty of bunkering and water hazards that are bounded by his signature wooden retaining walls to test your skills. With wet grips and time on our hands, we made an executive decision to drive 40 minutes southwest to put in a few hours at the World Golf Hall of Fame. What a great call! This 75,000 square foot non-profit museum features a huge array of historical artifacts, priceless memorabilia, informative exhibits and interactive displays. Enough to keep the whole family entertained! It even includes a 300-seat IMAX Theater with an 80 foot wide by six-story-high screen featuring an ever changing array of non-golf adventure documentaries. Take your time touring the Members Locker Room. All of their collections have been donated by the members and their families. Then climb to the Trophy Room! Perched at the top of the 100-foot tower they display replicas of all the major championships trophies. A real treat is getting your picture taken on a replica of the Swilcan Burn Bridge from St. Andrews, originally built in 40 AD by the Romans. The World Golf Hall of Fame is about 45 minutes south of the Jacksonville Airport (JAX) with easy access off I-95 if you are heading to or from south Florida and is open Monday to Saturday 10 a.m. to 6 p.m. and Sunday noon to 6 p.m. Adult admission is $19.50 USD. There have been 146 inductees since it opened in 1998. Sadly there are only two Canadians. Marlene Stewart-Streit became the first Canadian member of the World Golf Hall of Fame in 2004. Her illustrious career included being the only woman ever to win the Canadian, British, American, and Australian amateur titles. In 2007, Charles Blair Macdonald was honoured. A Canadian by birth, he designed the Chicago Golf Club, the first official 18-hole golf course in America, won the 1895 U.S. Amateur and was one of the founding officers of the USGA. Feeling a little peckish, and of course parched, we stopped for lunch at Canadian Comedian/Actor Bill Murray’s original “Murray Bros. Caddyshack” restaurant location for great casual fun with a roadhouse style menu. 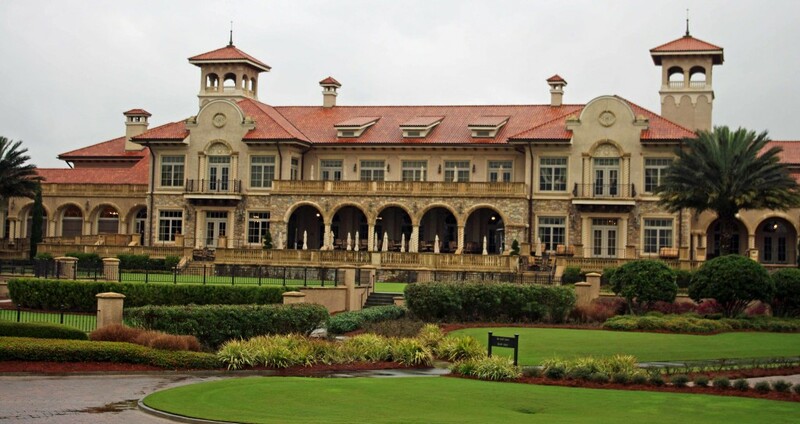 Driving back to Ponte Vedra, we wanted to see if there is any possibility of a tour of the legendary TPC Sawgrass, home of the annual PGA Players Championship. Our hope seemed crushed as we were immediately confronted with a gated entrance. Much to our surprise the guard let us in. I had no idea that this legendary icon was open to the public. As we pulled up the drive, I was amazed by the size and sheer grandeur of their 77,000 square foot Mediterranean Revival style clubhouse. The main foyer is elegant with old world charm, vaulted wooden ceilings and a gallery of paintings. We are greeted by a young hostess sitting behind a desk. I sheepishly asked her “Is there any way we can tour the building?” and she politely replied “No problem sir. I’ll have someone be right with you.” Although she invited us to relax in their comfortable lobby, I couldn’t sit. I was too damn excited. I began wandering around and taking photographs of everything that I could see. I felt like a kid in a candy store! 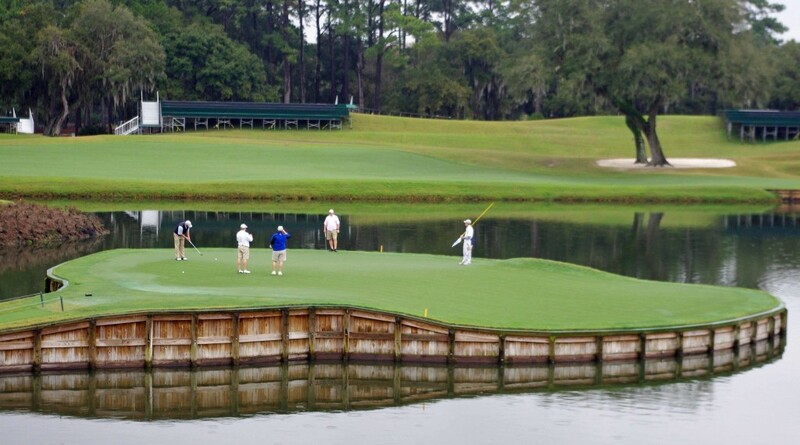 I even jumped when someone approached me from behind and said “Welcome to TPC Sawgrass. My name is Norma and I’m going to be your Storyteller for today”. “Ooookay! What’s a Storyteller?” I quickly found out that she is a retired Jacksonville police officer who like others volunteer their time to not only tour guests around the property but also tell us some very interesting and humorous tales. The first of many things I discovered was that all the fabulous artwork hanging in the main lobby where painted by Bart Forbes. 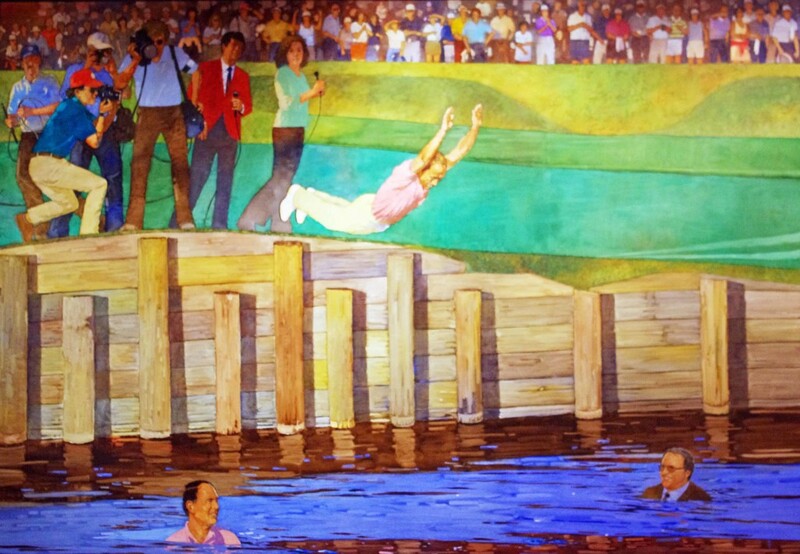 He uniquely re-created six memorable moments at THE PLAYERS Championship from original photographs. I recalled each and every one of them in vivid detail. With that, Norma said “Well are you ready to go for a ride?” I had no idea what she meant until we headed out the front entrance and hopped on a golf cart. Even though it was raining she was determined to get us out on the golf course. Our first stop was the Champions Circle so we could have our picture taken in front of the plaque commemorating Canadian Stephen Ames’s win in 2006. Then she whisked us alongside the 18th fairway to the daunting 17th with its island green. We stood at attention to honor a world renowned hole as she regaled us with how Deane Beman, the Commissioner of the PGA TOUR as the time, bought 415 acres of wooded swamp land for a $1 back in 1977 from Fletcher Land Development. Pete Dye was hired to design the layout as the first true stadium course with spectators in mind. The problem was that the highest point of the property was only 18 inches above the water level. They build a berm around the entire property and pumped out all the water. Then brought in dirt, and reshaped the existing terrain to form the contours and lakes. The Stadium course averages around 40,000 rounds per year and over 120,000 golf balls are found annually around the 17th island green along. You do the math! There are 57 cameras covering all the action of THE PLAYERS Championship. It takes four months to erect the spectator stands and another month to dismantle them and last year they estimated that they had 49,000 attendees on the Saturday alone. 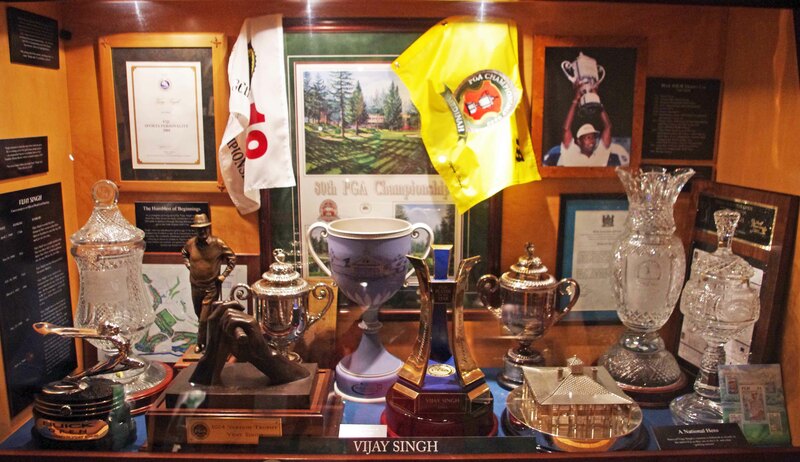 Back to the clubhouse we were guided through the West and East Gallery’s collection of memorabilia, the Champions dining room, the Ponte Vedra Room Terrace overlooking the TPC Event Lawn at the 18th green and the Gentlemen’s Locker Room. 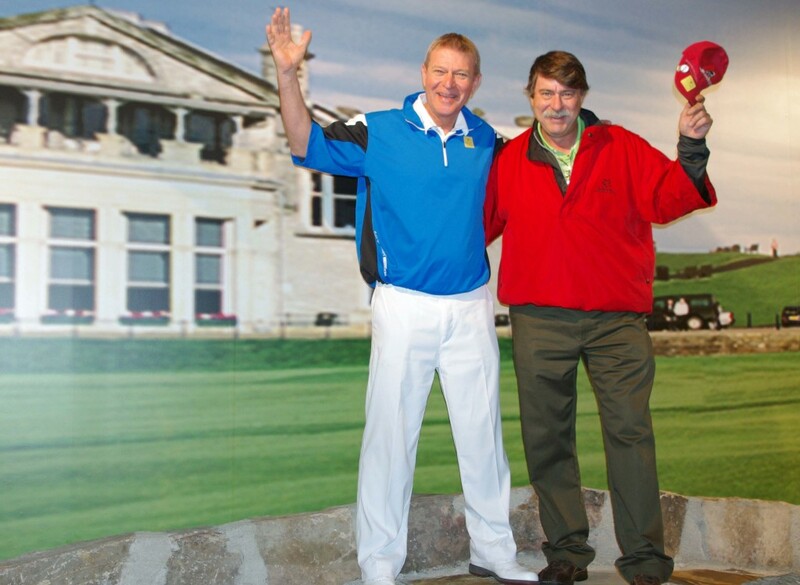 In fact, I accidently ran into PGA TOUR veteran, Fred Funk who lives in the area and a real gentleman. Along the way, we bumped into General Manager and PGA Master Professional Bill Hughes who graciously spent some time with us. I told him that I had no idea that this tour was open to anyone. 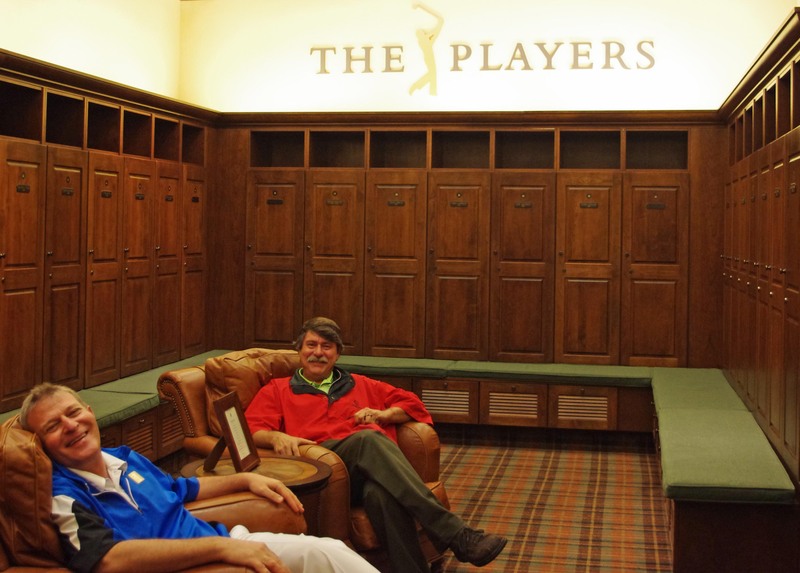 He explained to me that the clubhouse tours started immediately after being renovated for the 2007 PLAYERS Championship. He said that “The PGA TOUR wanted to create an experience for its TOUR Players, members, clients, and guests unlike anywhere else in the world. 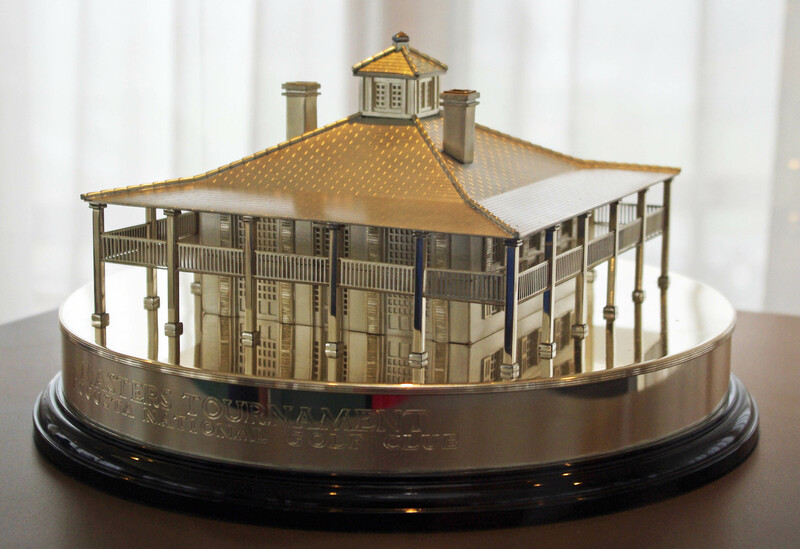 The storytellers are a key element of bringing to “life” the history and traditions of THE PLAYERS Championship and TPC Sawgrass to avid golfers and non-golfers alike.” I can’t agree more. What an experience indeed! Admission is free and open daily from 9 am to 5 pm. After our guided tour we stopped in for a pint at the Nineteen lounge with our new found friend and her husband to thank them for their kind hospitality and enjoyable conversation. I told them that I can’t wait to come back again and bring my grandsons. We didn’t get to play golf today but it was still one of the more memorable parts our trip. The best rain out day ever! Wow Dave, I guess there’s a first time for everything: a story about a rained out golf trip that makes you want to go play golf! Thanks for the inspiration. 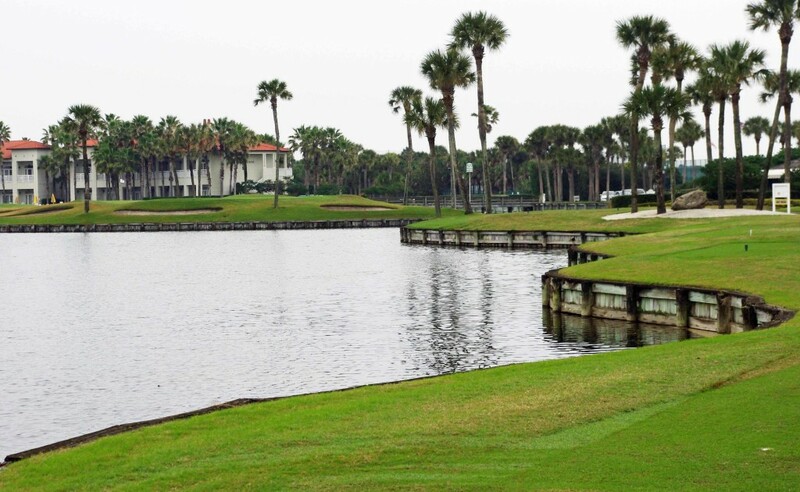 I look forward to the next time when I can play golf in Ponte Vedra & St. Augustine.